The fierce and brilliant blast of a supernova heralds the explosive, violent death of a star, and these stellar conflagrations can glare so brightly that they may even outshine their entire host galaxy--at least for a time. On January 21, 2014, an exceptionally close stellar explosion became the brilliant object of pursuit for astronomers all over the world--as well as for several NASA spacecraft. The blast, dubbed SN 2014J dazzled the galaxy M82, situated a "mere" 12 million light-years away from our planet. SN 2014J is the closest optical supernova to light up the sky in twenty years--and it is potentially the closest Type Ia supernova to flare-up during the life of today's missions, astronomers said--providing a rare chance to study such Cosmic occurrences. Image by John Strong of Galaxy M82 with SN2104J. SN 2014J is the most brilliant supernova to be spotted from our planet since the gigantic stellar blast that popped off back in 1987--just 168,000 light-years away. In fact, the January 2014 supernova was so dazzling that it was brilliant enough to be discovered with a small 'scope peering up at the murky cloud-shrouded sky hovering above north London. 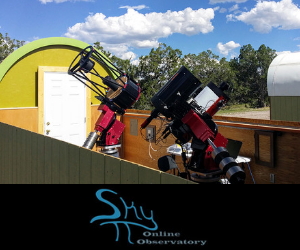 On January 21, 2014, Dr. Steve Fossey, an astronomer at University College London, was taking a group of 21 students through a routine lesson with a 35-centimeter 'scope at the urban University of London Observatory. As he showed his students images of the galaxy M82, also known as the Cigar Galaxy because of its shape, they spotted something odd--a brilliant star nestled at the very edge of the galaxy's disk. M82 hangs just above the bowl of the Ursa Major (Big Dipper) constellation, and it has long been a favorite deep-sky target for astronomers. The brilliant star, that Dr. Fossey and his students saw on an image snapped during a 10-minute viewing session, seemed to be a newcomer. Dr. Fossey could not remember ever seeing it before, and it was not present in images that he and his students looked up on the Internet. "It kind of looked odd," Dr. Fossey said on January 23, 2014, Scientific American. 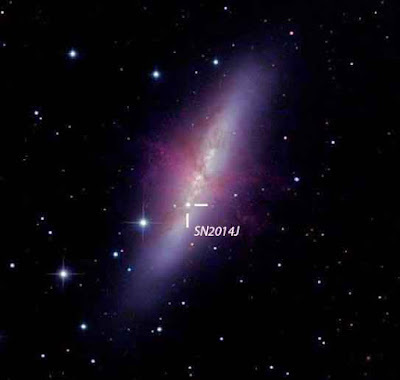 According to the students who spotted SN 2014J, the exciting discovery was a stupendous surprise. "One minute we're eating pizza, then five minutes later we've helped to discover a supernova. I couldn't believe it. It reminds me of why I got interested in astronomy in the first place," said student Tom Wright in a January 2014 statement to the press. 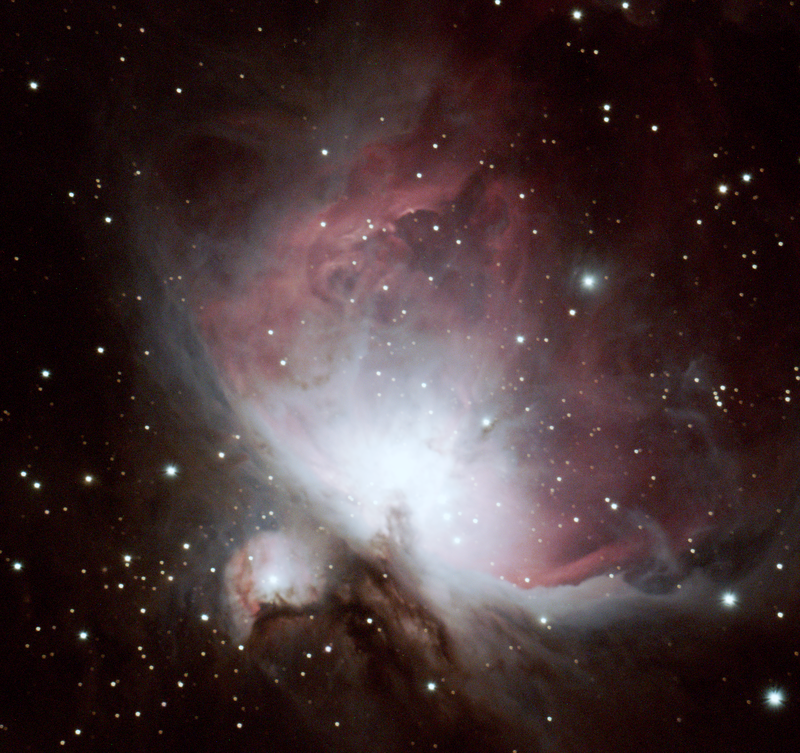 Another student, Ben Cooke, also commented in a January 2014 press statement that "The chances of finding anything new in the sky is astronomical, but this was particularly astounding as it was one of the first images we had taken on this telescope." All stars, large and small, "live" out their entire hydrogen-burning, main-sequence "lives" by maintaining a very critical and delicate balance between two constantly opposing forces--gravity and radiation pressure. The radiation pressure exerted by a star pushes everything outward and away from the star, and it keeps this huge, seething, glaring sphere of roiling gas bouncy against the squeezing crush of gravity, that mercilessly and relentlessly attempts to pull everything inward. The radiation pressure of a star on the main-sequence results from the process of nuclear fusion, which begins with the burning of hydrogen, the lightest and most abundant atomic element in the Universe, into helium--which is the second-lightest atomic element. This process, stellar nucleosynthesis, continually fuses heavier atomic elements out of lighter ones. In fact, all of the atomic elements heavier than helium (termed metals by astronomers), were created in the searing-hot nuclear-fusing hearts of the billions upon billions upon billions of stellar inhabitants of our vast Cosmic Wonderland--or else in the spectacular blasts of supernovae heralding the end of that long stellar road. Most supernovae ignite when a solitary star runs out of its necessary supply of hydrogen fuel, and blasts itself to smithereens, thus meeting its fiery ultimate doom. Often, the supernova progenitor is a massive star, with an extremely heavy core that tips the scale at approximately 1.4 solar masses (the Chandrasekhar limit). Smaller, less richly-endowed members of the stellar community, such as our own Sun, normally do not die in the incredible brilliance and violence of a supernova conflagration, like their more massive starry kin. Small stars, like our own, perish with relative peace, and incredible beauty. Our Sun, at present, is a common garden-variety and a rather petite main-sequence Star. There are eight major planets, a multitude of lovely moons, and a large number of other, smaller objects, circling our Sun, which is happily situated in the distant suburbs of a majestic, large, barred-spiral Galaxy, our Milky Way--which is a beautiful, starlit pin-wheel twirling in Space. Our Sun, like all stars, will not live forever. Like all stars, it is doomed to, at some point, run out of its necessary amount of hydrogen fuel. Stars of our Sun's relatively petite mass can "live" out their main-sequence lives for about 10 billion years, happily and contentedly fusing their core's supply of hydrogen into heavier things. However, our Sun is not exactly a spring chicken. In fact, it is a middle-aged Star. It's not old, but it isn't young, either. However, it is experiencing a happy and productive mid-life, and is still sufficiently bouncy to go on merrily fusing hydrogen in its hot heart for another 5 billion years or so--alas, it has already lived for about 4.56 billion years! When small stars like our own have finally succeeded in fusing most of their supply of nourishing hydrogen fuel, they swell into the glowering, bloated red giant stars. The elderly Sun-like star at this point carries a worn-out heart of helium, encircled by a shell in which there is still some lingering hydrogen that is being fused into helium. The shell swells outward, and the star's expiring heart grows progressively larger and larger, as the doomed star grows older and older. Next, the helium heart itself begins to shrivel up under its own weight--and as it does so, it grows hotter until, at last, it has grown so extremely hot at its center that the helium starts to fuse into the still-heavier atomic element--carbon. The Sun-like, petite star winds up with a tiny, searing-hot heart that manufactures more energy than it once did, long, long ago, when it was a vibrant young main-sequence star. The outer gaseous layers of the elderly, doomed star have become swollen and red. Tragically, in our own Solar System, when our Sun has finally become a bloated, old, red giant, it will furiously cannibalize some of its own planet-offspring--first Mercury, then Venus, and then (perhaps), our Earth. The temperature at the fiery surface of this hideous, hungry red giant will be considerably cooler than it was when our Sun was still a vibrant, young, life-sustaining Star! The death of small stars like our Sun is relatively gentle, characterized by the "soft" puffing off of their outer gaseous layers of shining, multicolored gasses into the space between stars. These objects are so enchantingly beautiful that they are often referred to as the "butterflies of the Cosmos" by astronomers who are bewitched by the spectacle. Our Sun will perish this way--with great beauty, and in relative peace. But this is because our Sun is a solitary star. It has no companion star around to disturb its hermetic bliss. The Sun's corpse will be a dense, small stellar relic called a white dwarf, and its shroud will be a glimmering, shimmering, "butterfly" with flying wings of many colors. However, something very different occurs when a Sun-like star has another star for a companion--rudely disturbing its peaceful solitude. This can cause some very explosive things to happen. Small stars usually do not carry sufficient mass to go supernova. However, this kind of blast can happen if two stellar-relic white dwarfs collide and merge, or if a solitary white dwarf dwells in close contact with a companion sister-star--and victim. The unlucky companion star could be either a main-sequence star or a swollen red giant. In either case, the white dwarf, with a vampire-like hunger, sips up material from the companion star--and gulps down as much as it can until, at last, it can drink no more. The white dwarf "goes critical" just like the big guys, and blasts itself into oblivion in the supernova event called a Type Ia. Astronomers think that SN 2014J is a member of the Type Ia class and that it can help explain how these supernovae develop. Type Ia supernovae are "standard candles"--that is, they are used as Cosmic measuring sticks by astronomers to help them determine the increasing expansion of the Universe. Observations of SN 2014J's spectroscopy revealed its status as a Type Ia. This type of supernova brightens rapidly. Even though many such supernovae are spotted annually, they are usually much further away than the Cigar galaxy. Astronomers around the world will now carefully observe the exact way in which SN 2014J brightens. They have used the consistency of the brightnesses of Type Ia supernovae in the past to make very precise distance measurements. In fact, these Cosmic "standard candles" were of critical importance in the discovery of the dark energy in the 1990s. Dark energy is a mysterious force, a property of Space itself, that is causing the Universe to accelerate in its expansion. The Cigar galaxy's close proximity means that there are many existing images of it, dating from before SN 2014J exploded, including some that were derived from the Hubble Space Telescope. Astronomers will carefully study those images, searching for what existed in this region before the stellar blast. The Cigar Galaxy is heavily shrouded with dust--the light of the supernova shines on the dust in such a way that it may teach astronomers something about the galaxy, as well. One team of astronomers is currently searching for radioactive elements there, such as nickel, that some theories predict form in Type Ia supernovae. One of the first telescopes to gaze at SN 2014J was NASA's orbiting Swift observatory, which captured an image of the supernova and its host galaxy, with its Ultraviolet/Optical Telescope. "Finding and publicizing new supernova discoveries is often the weak link in obtaining rapid observations, but once we know about it, we can observe a new object within hours," Dr. Neil Gehrels told the press on January 27, 2014. Dr. Gehrels is the Swift observatory's principal investigator at NASA's Goddard Space Flight Center. Judith E. Braffman-Miller is a writer and astronomer whose articles have been published since 1981 in various newspapers, magazines, and journals. Although she has written on a variety of topics, she particularly loves writing about astronomy because it gives her the opportunity to communicate to others the many wonders of her field. Her first book, "Wisps, Ashes, and Smoke," will be published soon.